Yandex.Checkout allows you to send money to all your clients at once. This might be useful for microfinance organizations (granting loans), online games (paying winnings), and other services of that kind. mobile phone balances (Megafon, MTS, Beeline, Tele2). Payouts may be performed by organizations: sole proprietors and corporations, including non-Russian residents. Recipients can only be individuals. Everything is set officially: we provide documents for accounting department and tax service. To activate payouts, you need to sign up for Yandex.Checkout and enter into contract with Yandex.Money. Integartion is carried out via . You transfer money to your security account in Yandex.Checkout. If your client is to get a payment, send us an order with details for payout. The client receives money, and you get notifications and documents. Entire interface is on your side. We only provide access to our API. Anonymous user: 1 to 15,000 rubles at a time. Reviewed or identified user: 1 to 60,000 rubles at a time. To any Wallet: up to 600,000 rubles a month. up to 600,000 rubles a calendar month. This limits apply all client's cards (the check is made by passport details). Example: you transfer money to two bank cards of your one client. If you transferred 400,000 rubles to the first one, you won't be able to transfer more than 200,000 rubles to the second one in this month. When making payouts, you need to specify the client's phone number. The limits apply all bank accounts linked to one phone number. This limits apply all client's bank account (the check is made by passport details). Example: you transfer money to two bank accounts of your one client. If you transferred 400,000 rubles to the first one, you won't be able to transfer more than 200,000 rubles to the second one in this month. Direct carrier billing 4% instantly To one number, you can pay 1 ₽ to 15,000 ₽ at a time. The service fee is deducted at the end of the day (12 AM or later). Yandex.Checkout furnishes all documents that your accounting department or tax service may need. We send Payment Registers daily via email. And separate ones for successful and returned payouts. Certificates on services rendered are created once a month and sent via email. You can additionally apply for accepting them in hard copy. For starters, you need to file an application for onboarding with Yandex.Checkout. You will be assigned a personal manager. He or she will call you or write to you. Tell your manager you want to activate payouts to clients. The manager will tell what documents you need to prepare. Enter into the contract for making payouts to individuals with Yandex.Money. Check the integration via and verify that everything works fine. Transfer the required amount to your security account. Now you are ready to pay clients the necessary amounts. In your Merchant Profile, you will be able to view your operation history, check your balance, and check with settings. Note. If you have already entered into the contract with Yandex.Money and accept payments via Yandex.Checkout, tell your manager you want to activate payouts. Merchant Profile in which you can check the account balance and look through payment history, settings, tariffs, and banking details. It also allows you to put payouts on hold. View it under your Merchant Profile or request it via our protocol ( request). You can add money by a payment order from your company's checking account that you specified in the contract with Yandex.Money, NBCO LLC. Specify in your payment order the number of your security account (you can view it under your Merchant Profile or in your contract with Yandex.Money). Other details are . The money will appear on the account on the next business day. This may maximum take 3 days (depends on your bank). 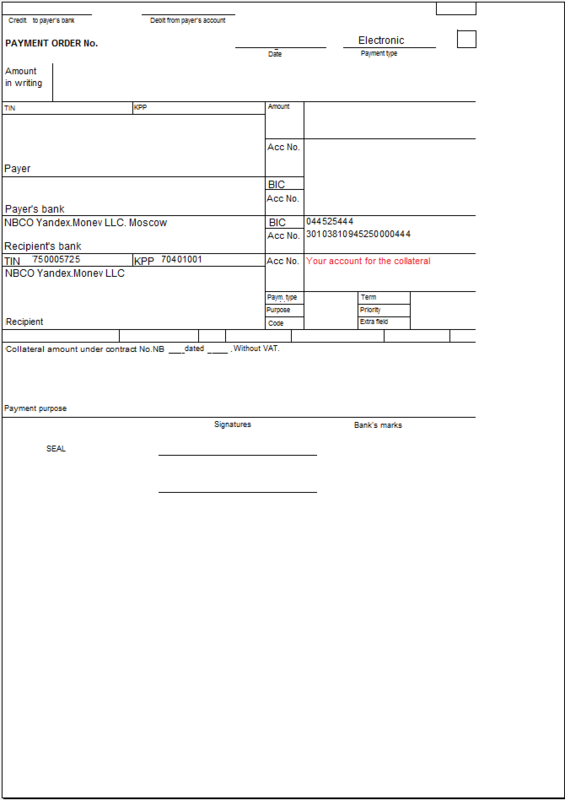 Write an official letter on your letterhead paper requesting to return the remaining balance to your checking account and send its scanned copy to your manager. We will handle your request and transfer the money.